Pres. 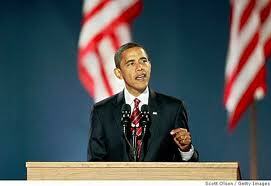 Obama's 2008 Election Night Speech Prophetic? Posted By:@AVGJOhanna | At:12:03 PM Be the first to comment! Forty-seven percent has now joined the American lexicon along with the 99% and the 1%. Those numbers are no longer mere percentages and statistics. They are now associated with a group of people. Unfortunately for Mitt Romney, he has wrongfully characterized the 47% and it could very well be the start of the demise of his campaign. Normally, I am pretty contextual and I try to hear the heart/intent of what a person is trying to say no matter how inartful. It drives me crazy when the media and politicians ignore context to make a headline. Anyway, when Mitt Romney tried to explain the remarks in the context of political strategy, I tried to give him the benefit of the doubt. All candidates have a political strategy. They all have to figure out which voting blocs they need to cater to. Makes sense and from a strategy standpoint solely, I am not offended by his comments. However, he took it to an offensive level by adding the comments of being victims and forever dependent on government which is highly untrue and speaks to the fact that he is out of touch with how many Americans live. Add to that the fact that there are poor and government dependent Republicans that are/were planning to vote for Romney. He may have indeed lost votes because of this statement. More than anything, it is simply bad strategy and old school thinking. How are you going to ignore nearly half of the electorate? This is a close race. Math would lead me to believe that you go after every vote you can get. But as former president, Bill Clinton, shared at the DNC Republicans do not seem to be all that sharp with arithmetic . The 2008 election was a political game changer. The 2008 Obama campaign was so brilliantly run that it set a standard. Many lessons were learned and tactics replicated in subsequent campaigns. That campaign was masterful with the 50-state strategy. How else could a virtual unknown become president? Recently I saw the President speak at a rally. He mentioned how pundits thought he had some other reason for asking Virginians to vote for him in 2008 because there was just no way he would ever win the historically red state. At the rally, he said it wasn't anything deeper that what it was; he wanted their vote and thus asked for their vote. And to the shock of the political analysis world, Virginia went blue. Barack Obama had won Virginia among several other "red" states. Classic case of you have not because you ask not. What really impressed me about the Obama campaign was the fact they reached out to groups that other campaigns ignored, even the campaigns of other Democrats. My hometown of Gary, Indiana has it's share of issues. But it does not mean that the people of GI do not matter. I was already on guard and ready to lump Mr. Obama into the same category as other politicians, none of which in my lifetime every came through my city. I mean how was a brotha from the south side of Chicago going to ignore his next door neighbor? Well I was pleasantly surprised that he did not ignore my hometown. And not just my hometown, he played basketball on the campaign trail in another city that I onced lived in. I actually know people that have gotten to shake the man's hand. Something I am sure they never once before desired and now something they will likely never forget. The mere fact that I can say that I have seen the President, First Lady and the Vice President live in person says something. For me to stand with sheer pride outside the gates of the White House during my first visit to Washington DC says something. Something that the Romney campaign does not seem to get. If you engage me (actually engage me and not insult my intelligence as he did at the NAACP convention), I may very well respond in your favor. Prior to the 2008 election, if you would have said that I would become even the slightest politics junkie, I would have laughed you off. Clearly that is not the case for me now and it is not the case for alot of people. Sure not everyone is paying attention, but more than ever before people are paying attention and do not want to be taken for granted nor their vote discounted or suppressed. They have been awakened to the fact that their vote matters. For any politician to have not learned that lesson from the 2008 election, in my opinion, does not deserve to be the face of my country because he cannot accurately represent me and millions of other Americans. Onto the idea behind the title of this particular essay. One of the most memorable lines of President Obama's 2008 election night speech was him reaching out to those that did not vote for him. He said he would work to be their president. It was a genuine and heart-felt statement. Along with many others, I clearly remember him making that statement. It was the first contrasting comment that I thought of when I learned of the Romney-47% story. Was it prophetic? I guess it depends on how you look at it. Specifically with this story, there is historical record of the President that shows the stark difference between the two candidates. He did not have to merely respond with an opposing position and now try to work it into his stump. It is already a part of who he is. For the Romney campaign's erroneous strategy to be made public and for the President to already have the perfect built-in response top of mind for many people makes me think something greater might be going on.